This film is trippin’! It may not garner any Oscar nominations, but it’s definitely the most fun option of the week for anyone in the mood for a comedic escape. Girls Trip delivers what Rough Night failed to just a few weeks ago… and that’s a raunchy yet relatable female ensemble comedy in the spirit of the highly-successful Bridesmaids. Girls Trip is directed by Malcolm D. Lee (The Best Man franchise; Barbershop: The Next Cut), and while it may primarily be marketed to the African American community, it deserves a much broader audience. Girls Trip is about four longtime friends who’ve drifted apart since their wild college days as the “Flossy Posse”. They reconnect for a trip to New Orleans where one of the women, Ryan Pierce (Regina Hall) is set to deliver the keynote address at the annual Essence Festival. The rest of the posse includes: Sasha (Queen Latifah), a journalist who’s become dependent on breaking TMZ-type stories to pay the bills; Lisa (Jada Pinkett Smith), a ‘responsible’ single mother who’s forgotten how to let loose and have fun; and Dina (Tiffany Haddish), the unapologetic party animal with no filter who stashes drugs “where the sun don’t shine.” Haddish is most definitely the breakout star of this film, stealing just about every scene she is in. Over the course of (an overly long) two hours, the women rediscover their sisterhood while dancing, drinking, brawling, romancing, and bonding. The physical comedy includes some shockingly funny bits that will forever change the way you look at a grapefruit or challenge your bladder. This film is rated R for a reason! The World War II drama Dunkirk is being touted by many critics as a “masterpiece!” or “the movie event of the year!” But I’m a bit more tempered in my appreciation for the film, which has a lot going for it but could disappoint moviegoers who prefer a more conventional narrative. Writer/director Christopher Nolan (Insterstellar, Inception, The Dark Knight) delivers his most experimental film since Memento in 2001. So it’s best to go into the film knowing some backstory and watching it on the biggest screen possible. This is NOT the type of movie you wait to see on Netflix. Slate.com offers up a great explainer of all the different formats that Dunkirk is available in, and why size matters. It’s worth a read/watch. The film, inspired by true events, opens with hundreds of thousands of British and Allied troops trapped on the beaches of Dunkirk, France as German forces are closing in on their location. They couldn’t get home – so home came to them, in the form of an armada of civilian fishing and pleasure boats. The story is told in non-linear fashion from the perspectives of land, sea and air. There are dogfights in the sky, ships blown up at sea, and shell-shocked soldiers scrambling along the sand. The struggle for survival plays out over 106 tension-filled minutes scored by Hans Zimmer. It’s a cinematic composition that goes all sorts of places before finishing with a flourish that captures the fog of war as well as the human spirit. Dunkirk is very abstract with minimal narrative and dialogue from an ensemble cast that includes Tom Hardy, Mark Rylance, Kenneth Branagh, Cillian Murphy, Fionn Whitehead, Aneurin Barnard, Harry Styles, James D’Arcy, Jack Lowden, Barry Keoghan and Tom Glynn-Carney. The performances are all quite good, but I had a hard time telling many of the characters apart. The only real exception was during a story thread that involved Rylance as a British civilian who heads out with his son and a family friend on a private boat to try and get to Dunkirk. Maybe we’re not supposed to get hung up on exactly who’s who out in the battlefield. We’re just along for the ride… a fly on the ‘wall’ of the land, sea and air in the midst of one of the greatest rescue missions in history. Plenty of people will love this movie, but it’s not for everyone. So keep those expectations in check. Forewarned is forearmed. Valerian and the City of a Thousand Planets is a perfectly fine but forgettable space alien action movie from director Luc Besson (The Professional, The Fifth Element, Lucy). It’s based on a graphic novel that I’d never heard of, and features a pair of flirtatious special operatives Valerian (Dane DeHaan, A Cure for Wellness) and Laureline (Cara Delevingne, Paper Towns) who help maintain order throughout the human territories in the 28th Century. The Minister of Defense sends them on a risky mission to Alpha, a vast metropolis that is home to species from a thousand different planets who gather to share knowledge and culture. A dark force threatens to undermine the peace at Alpha as well as the survival of the universe. The film has plenty of flaws, not the least of which is a running time of 137 minutes. But it moves at a fairly steady clip, has some great visuals and 3D effects, and feels a bit like an extended special episode of Star Trek or Battleship Galactica. Valerian and Laureline seem far too young to be officers in anything other than a 21 Jump Street reboot, but at least they’re cute, have each others’ backs, and hold their own in battle. The middle of the film is a muddled mess in terms of plot and character development. Ethan Hawke and Rihanna seem shoe-horned into the action as an eccentric pimp and his chameleon of a prostitute. A trio of alien snitches pop up on occasion to provide some comic relief. And the fate of the world rests on an armadillo-looking creature (known as a “converter”) that can replicate and then – um – excrete precious pearls. Hey, this is sci-fi fantasy for a hot summer day. Don’t overthink it. Note: I don’t think this trailer does the film any favors. 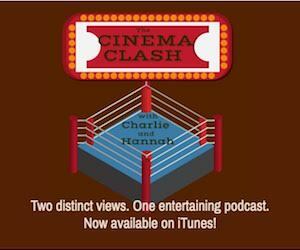 For more on the movies mentioned above, as well as an arty film from Thailand about a man and his elephant, tune in to this edition of the Cinema Clash with Charlie and Hannah! Also available on iTunes!